This fully functional pipe tomahawk has a brass axe head that is also a working pipe. The handle is a buckskin wrapped wood pipe stem. It is decorated with white rabbit fur and has beadwork done in deep indigo blue and lavender glass seed beads on the handle. This peace pipe measures about 16" long. The brass pipe/tomahawk head is 7 1/4" x 2 5/8" at the widest part. 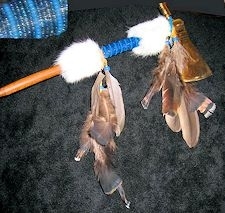 The buckskin streamers are decorated with lavendar and black glass crow trade beads, goose feathers, and bronze irridescent turkey fluff feathers. This product was added to our catalog on 11/15/2008.